This has to be the best free storage system there is! Available in several sizes, short/medium/tall oblong, short/tall large round and short/tall small round. If you don't do "Takeaways", ask some one who does to collect them for you, or you can buy them in pound shops or online. Ideal for parts, scatter, static grass, foliage, electronics, etc, etc. I've been collecting for years, different makes and different colours. They are Tate & Lyle Shake n Pour 750g sugar containers, an expensive way to buy sugar, but I got them from work when ever they finished one. Lightweight, unbreakable, secure lid, pour/shake options. This is an ideal box for your engine, carriage and wagon stock. It’s sturdy construction and perfect dimensions combined with a keen price make it a great way to protect your stock. Remove the spring clip and line with foam, these will stack horizontally and are still easy to slide one out from the bottom. Source:- All good stationers, Staples, Chain stores, Wilko. Keep all your brass/plastic tube, profiles, bar, wood sticks, etc neat, tidy and readily accessible with this easy to construct storage system. 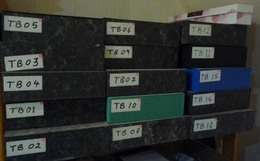 Source tubes by collecting toilet rolls, kitchen wrap/foil rolls, post tubes or other. 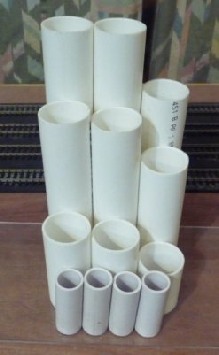 Wrap several in thin card and glue with PVA to make longer tubes. Glue rows together on a flat surface. Glue first row to ply base, then subsequent shorter rows to first row and base starting with the tallest. For further robustness, add plywood sides to form a box. Free in hotels and restaurants (or if you don't use them, just ask for some used empties), these cute little jars are ideal storage pots with a re-sealable lid that are ideal for paint, glue, scenic materials, weathering powders, you name it! Price guide:- Free if you buy the jam! This is a sturdy construction and combined with a keen price make it a great way to store your bits. These will stack and are still easy to slide one out from the bottom. Similar to a shoe box but slightly wider. 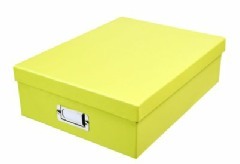 Of course not as cheap as free shoe box’s, Just mention to your friends that you are collecting them.